Photo Caption:Woodforest Bank branch managers from across the state joined Kim Marling, Executive Director of Woodforest Charitable Foundation and Patricia Wakim, Executive Director of Over-The-Rhine Kitchen. 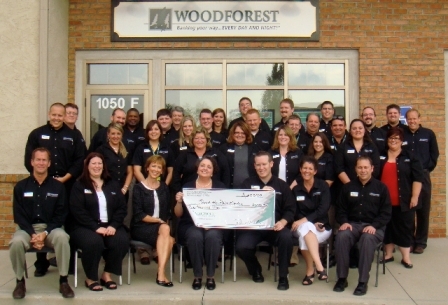 CINCINNATI, Ohio (September, 2009) – Over-The-Rhine Kitchen welcomes a $3,000 donation from the Woodforest Charitable Foundation. With Ohio’s unemployment rates hitting a new high at 9.5 percent, hundreds of thousands of residents may be at risk of hunger (Bureau of Labor Statistics). Woodforest Charitable Foundation’s recent contribution will help support Over-The-Rhine’s mission of alleviating hunger in their community. The Over-The-Rhine Kitchen, which was founded in 1976, is the oldest operation of its kind in Cincinnati. It began when Father Tom Bokenkotter, seeing that 80% of the residents in the Over-The-Rhine neighborhood were living below the poverty level, recruited a group of volunteers. With just $700 in the bank, they started serving warm meals in a building on Main Street. In 2003, the operation was moved to its current location on Vine Street, where a hot meal is served five days each week. For more information about Over-The-Rhine Kitchen, please call (513) 241-5121 or visit the Kitchen’s website at www.overtherhinekitchen.org.